I posted some time ago about how to get a new (ui) theme for your osCommerce store. 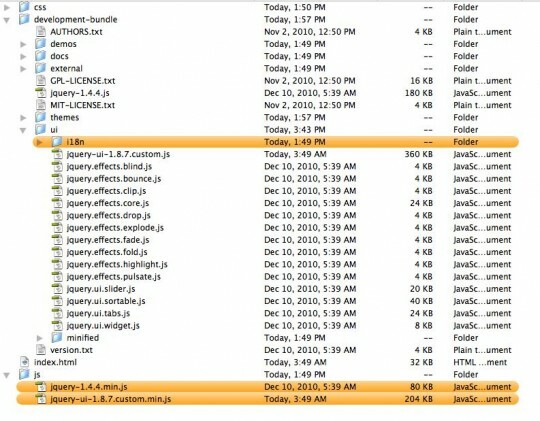 Doing this today, you will notice that jQuery UI upgraded their version, and that means that, if you want to get a new ui theme, you have to upgrade the ui version that is used in your osCommerce store too. I red somewhere in the osCommerce forums that it would be enough to just rename the “jquery-ui-1.8.7.custom.css” changing the 1.8.7 to 1.8.6 and that’s it. I can not really say that I share this opinion, what I can say is, that doing so will result to expected and unexpected problems. I’m not a jQuery UI expert, but I want my datepicker to be working, just an example. The correct thing is to upgrade, and thats easy to do. Of course, also the line No 29 need’s to be changed, the one that refers to the UI theme to be used, we need to use a version 1.8.7 theme, that’s finally the reason of the upgrade. Upgrading jQuery to 1.6.2 causes the text “undefined” to appear below the product image on the product info page. I just changed one line in template top to use jQuery 1.6.2 and encountered this problem. Very clear easy to use tutorials you have here! Extremely useful site. Thanks for your tutorials, I am delivering two websites using oscomerce for the first time and has lessened the pain of using new technogies. My site not live yet, but just wanted to say thanks for the posts. Very very clear and professionally done. Or maybe even better by adding an extra column in product description table so that each product picture owns a unique caption, which may be good for SEO purpose? Parameters that can alter FancyBox behaviors have never been very well documented by anybody in the official osC forum. A post covering those features would be much appreciated! have been trying to change the template from original oscomerse redmond and have followed outline but where you say about changing custom 1.8.6.css on the theme creator you have i get a 1.9.2 and when i try to get the new theme installed what happens is that i loose all the blue and am left with all the text and no boxes. have reverted to redmund for time being. any ideas. am pretty new to this stuff but it seems straight forward the way you have explained it.so point me in the right direction if poss. thanks. How do I handle these for a correct update from the jQuery? Bringing the old thread to life.. I just updated my 2.3.1. to jquery 1.11.0 and UI to 1.10.4. Works perfect. The only problem I have now is that the images (on enlarge) open in a new tab/window. But it seems to be more of a quick fix, not a permanent solution. Wouldn’t a fancybox upgrade to v2 be a better alternative?